Information sheet "steinert maximo" as pdf file for download, please click here! Smooth electronic rotatinal speed control with reversible acceleration and breaking time. Mobile control panel which is connected with the frequency converter by a spiral cable. The power is transferred with a three-step Poly-V-belt transmission with high performance belts type 12 PJ 836 (belt width 28 mm / 1,1 inches). 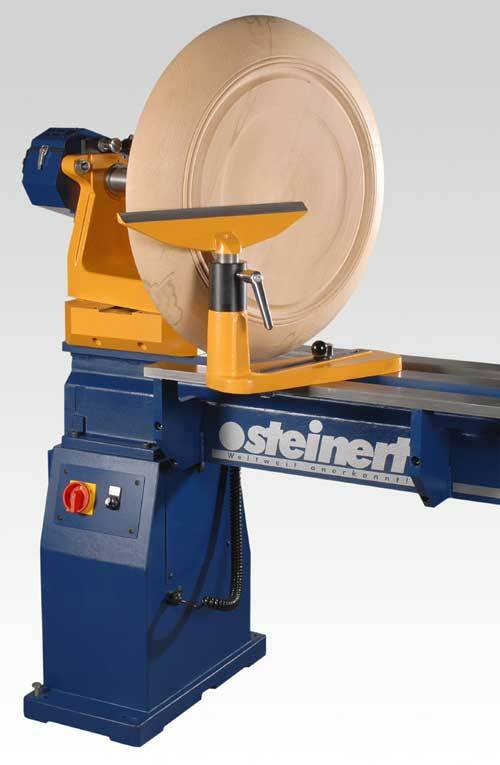 Optional accessory: Outer bed for big turning diameter between centers (posts up to Ø 670 mm / 26,38 inches), outer turning device for big disc-shaped workpieces (Ø bis 2000 mm / 78,74 inches), diverse chucks, drive centers, live centers, tool rests 180 mm / 7,09 inches, 275 mm / 10,83 inches, 1000 mm / 39,37 inches, diverse steady rests, drilling steady rests, oval turning device, attachment for small turnded parts, closed headstock with SPH 400 mm / 15,75 inches, drilling sleever, pneumatic tailstock.